During the 2019 Legislative Session, we are proud to continue our fight to protect Florida’s job creators. Each year, Florida’s business community faces a variety of tough issues and 2019 will be no exception. 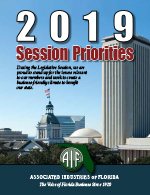 This publication highlights our 2019 legislative priorities, which will be distributed to all 160 members of the Florida Legislature, the Florida Cabinet and Agency Secretaries, as well as AIF membership. This year, AIF will continue to fight against policies that will increase the cost of health care for Florida’s business community. Issues like prior authorization, retroactive denial of claims and removal of step-therapy protocols will cause employers to pay more for their employee’s healthcare. AIF remains committed to fighting these issues in the halls of the Capitol. You can expect AIF to lead the business community in opposing legislation that would make it more expensive for businesses to operate in our state. AIF will be keeping a watchful eye on legislation being pushed by the Trial Bar, such as prejudgment interest. Further, you can expect AIF to support badly needed reforms dealing with Assignment of Benefits (AOB) abuse, bad-faith and workers’ compensation, to name a few. Additionally, we will see numerous legislative proposals that revolve around Governor Ron DeSantis’ $91.3 billion budget proposal for FY 2019-20. His proposed spending plan, which includes $335 million in tax cuts, will go a long way in continuing to help our state achieve the prosperity and growth our hardworking Florida families deserve. He has already made vital efforts to strengthen our economy, address our environment and science-based water quality projects, fuel hurricane recovery efforts, and broaden technical and STEM workforce development. We applaud Governor DeSantis and the Legislature for continuing to propel Florida forward and making the Sunshine State one of the best places to do business in the United States. As we began to work with our member-driven policy councils on the 2019 Session Priorities, the Florida Council of 100 released, “Project Sunrise –An Economic Competitiveness Strategy for the State of Florida.” We recognized several areas in the publication where our positions on issues mirrored theirs. Therefore, AIF and the Council agreed it would be mutually beneficial to promote those strategies and goals together. Seeing those goals achieved legislatively would be for the overall good of not only the business community, but will also improve the economic well-being and quality of life for all Floridians. As such, please note there are several issues contained in the 2019 Session Priorities that encompass language that were born from our member policy councils and the Council’s Project Sunrise, which ultimately received final approval from the AIF Board of Directors. These important issues, as well as others, are laid out in greater detail within this publication, summarizing the guiding principles which shape AIF’s legislative positions. AIF’s lobby team will work diligently to support these positions, in collaboration with AIF staff and our Board. Since 1920, it has been our privilege to represent Florida businesses, and we look forward to continuing our history of success in 2019.